Maybe the Public Hot Tubbing with a 10-Year Old Was Too Much? We remember going to the St. Peters Rec-Plex back in the day. They played on song seemingly over and over again all day: “The House of Stone and Light” by Martin Page. You know the song…the one with the thing and the guy singing. Yeah, you got it. Anyway, great place for a kid though despite the constant repetition of one-hit-wonder mid-90’s Stonehenge anthems. The ice skating, the big water slide, basketball courts, having 29 year olds with Amish beards getting to second base with 10 year olds in the hot tub….wwwwhhhhhhhhaaaaaaatttt?! Was that a repressed memory or a thing that recently happened?! Tell me blockquote! Tell me! Authorities say the alleged abuse happened on October 1st and was reported by another visitor at the pool. 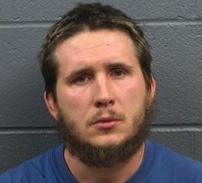 The visitor told police she could not see exactly what happened in the hot tub, but she reported what seemed like unusual behavior between 29-year-old Kevin Weckherlin and the 10-year-old girl. According to a probable cause statement, filed in court, the girl told the investigator that Weckherlin touched her under her swimsuit in the hot tub. Is the “house of stone and light” the Rec-Plex…is it the hot tub? Is the “child”..well, the child? Did Kevin Weckherlin “op-open” his eyes? Is Page referring to this very event some 16 years before it took place?! No, homeboy’s a perv. A very stupid perv.